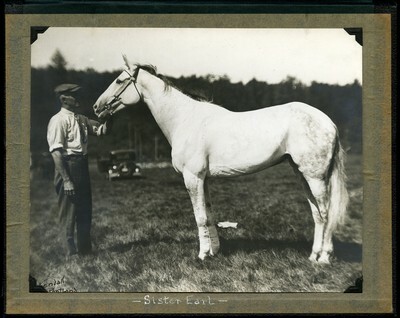 Black and white photo of gray mare, Sister Earl, being posed in an unidentified location with an unidentified trainer holding the horse's halter. Three of the horse's four legs wrapped. Wrapping for the fourth leg may be laying in the photo background.